The gateway town to the UNESCO World Heritage site, Angkor Wat, Siem Reap is throng with tourists. Angkor Wat is a huge temple complex and visited by thousands of tourists daily. Besides Angkor Wat, there are many temple complexes. Ta Phrom and Bayon are some featured here. 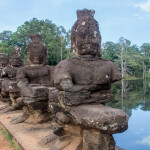 Select the album for pictures of Siem Reap sites.